The glass you use matters but I don’t let it define my whisky experience. I’m a relative novice when it comes to enjoying whisky. I very much enjoy the flavors but I don’t sit there savoring every last drop every single time I drink it. It’s like music. Sometimes I like listening to the beat, sometimes I want to hear the words, and sometimes I just want to vibe with the general mood and not get too into it. For the longest time, people drank whisky from any old glass because it meant whisky was getting into your body. 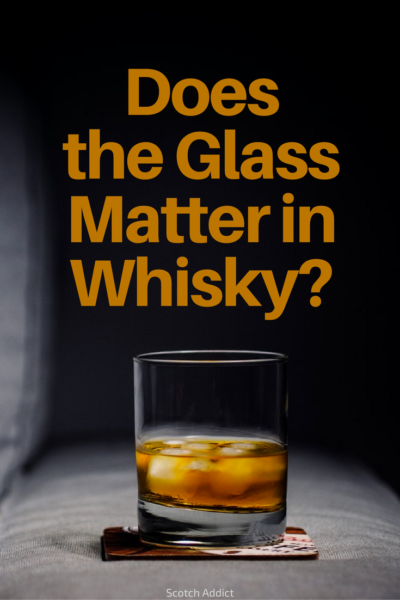 There are debates over which is the best glass for scotch whisky but personally I think there are a few that honestly are different and worth looking at. The rest is all fluff. 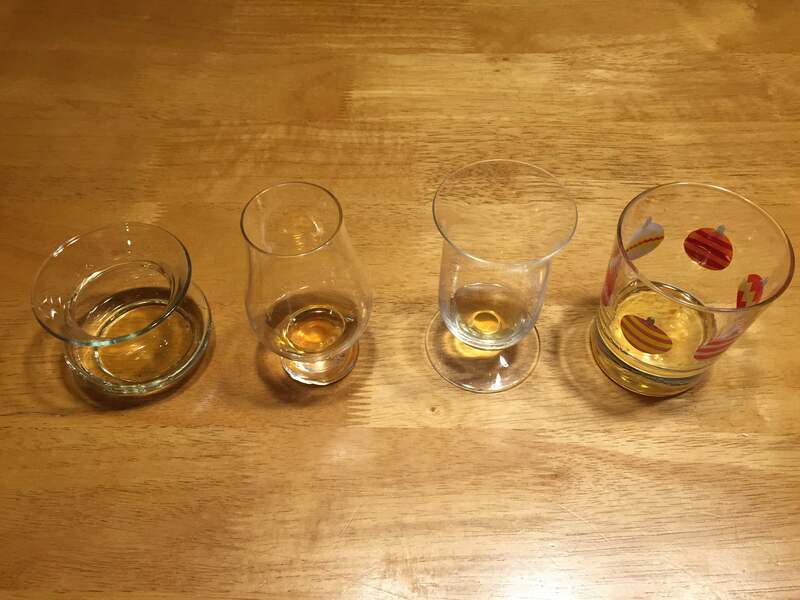 Personally, I usually use one of two glasses – a Glencairn or the NEAT whisky glass. I’ll explain why, plus a nod towards a new entrant to the market, and then I want to hear your opinion. Personally, I like these glasses because of the intensity. Since they’re so popular, they’re also relatively inexpensive. A pair will run under $15. I was sent a few NEAT glasses to give them a try several years ago and they really are kind of neat. I nosed the same dram in a Glencairn and in the NEAT and the NEAT delivered on its promise that it evaporated ethanol vapors and bring out the other aromas in a whisky. The shape isn’t unique but they’re more pronounced – it’s a tulip shape but more exagerated. The top tapers in more and the base is wider, which will allow you to swirl it a bit to wake up the spirit. It’s a fun glass to drink but near the end of a dram it does feel weird since you have to tip the glass nearly vertically for the last of the spirit to escape! 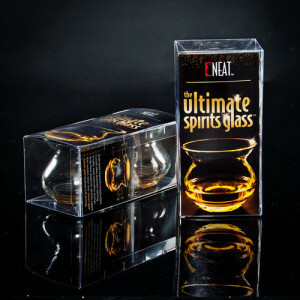 The NEAT glass is also affordably priced at under $20 for a pair. In recent years, there have been several whisky glass makers who have claimed whisky is tastier in their glass. The most recent, as of late 2017, is the Norlan Whisky Glass. I’ve personally never used it but there’s no debating how nice the glass looks. As for the design, it was “digitally crafted” with help from distiller Jim McEwan (formerly of Bruichladdich). 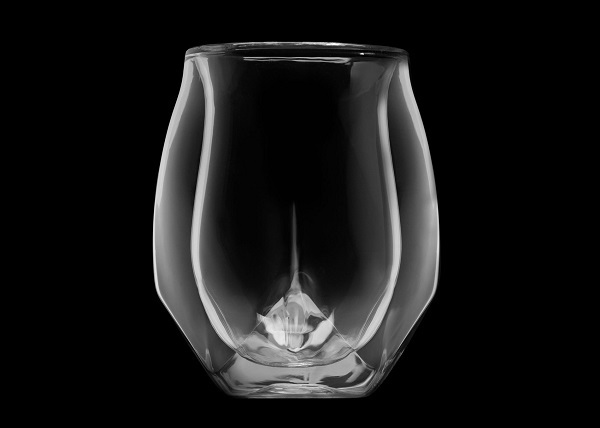 It’s double-walled tumbler design with curves meant to simplify the drinking experience and aerate the whisky, to reduce ethanol vapors and lower the need to add water. The only knock against the glass is that a pair will set you back $48. What do you think? Does the glass matter to you? They can also get dirty. Anytime you have glassware that has a narrow neck and a wide bottom, it be tricky to clean because you can’t get your standard brush in there. 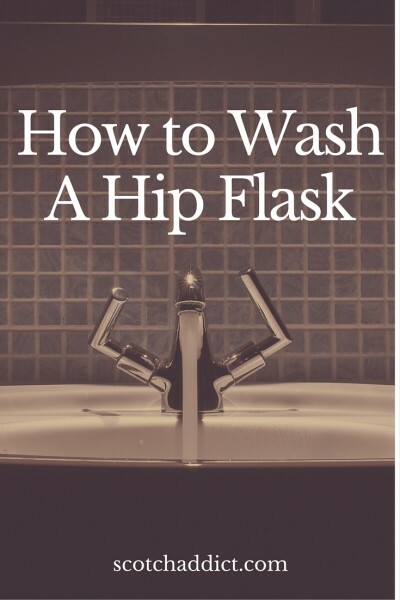 If you have some gunk in your decanter, whether from dried whiskey or something else, swishing it with hot water and soap (after soaking) might not do the job. How do you up your cleaning game? How do you get some scrubbing action in the decanter through the narrow neck? Try a different cleaning solution. If soap and hot water isn’t working, you can try a 50-50 mixture of white distilled vinegar and water. This is a time tested cleaning solution that you can use anywhere. Vinegar is a fantastic cleaning agent and easy to rinse out. If that’s not working, you can also try baking soda and water because it acts as a mild abrasive. Use a scrubbing agent. By scrubbing agent, I am referring to something that will fit through the narrow neck and act as your brush. The best ones to use are rice, salt, and crushed ice. Some places have suggested ball bearings and sand, but I don’t recommend those because they can (thought unlikely) scratch your decanter. As a last resort, buy a bottle brush. These are inexpensive and they will fit into the decanter so you can scrub any nooks and crannies that defy other methods. Once all the residue is gone, put in a small amount of bleach and let it sit for 10-15 minutes to sanitize it. Then rinse out your brand new decanter and air dry. That’s it! Dirty decanter is now clean! I’m not a purist but I don’t put ice in my single malt scotch. I rarely put it in any other type of whiskey I drink. Irish whiskey is so light it never needs it. I like feeling like a lumberjack when I drink bourbon and lumberjacks don’t use ice. So, when I was asked to share my thoughts on ice cubes at home, I had to think about what I cared about… and this is that post. There are two things that matter when it comes to ice and whisky. The size of the cube and the shape of the cube (yes yes, I realize how silly that sounds… a cube is a cube is a cube). Silicone – A great philosopher once said that silicone parts are made for toys and I think ice cube molds and trays fit the bill. Silicone means it’s really easy to get the ice cube out because the mold is easy to bend. Plastic molds? Too rigid, especially when you have a frozen block of ice, and you’re likely to break the ice (or the mold) as you try to get it out. Shape – A ball is better than a cube because it has less surface area, so it melts slower, which means less water and more cool. Tovolo Ice Molds are one of the highest rated sphere ice molds on Amazon.com and they’re cheap, under nine bucks. They make two 2.5″ ice balls and the mold itself is 3.5″ x 6″ and stack. They’re the #1 best seller in the Ice Cube Molds & Trays category, so that has to count for something. I don’t own them nor have I ever used them. If you want enormous cubes, Tovolo has HUGE 2″ ice cube trays. Again, thousands of reviews, and it’s cheap. Lastly, if you want to cool it down a little without watering it down, cubes of soapstone (a.k.a. whiskey stones) are a decent alternative. They won’t get them as cold as ice, but they won’t water down your elixir either. A couple weekends ago, we joined our good friends in a Light The Night Walk in support of the Leukemia & Lymphoma Society. Our friend battled through the disease and we’re always thrilled to support her. Having walked for a few years, I know one way to make the 2 miles walk more entertaining is to bring us a little something something. That something something was some Glenlivet 12. So I filled up my two nicest flasks – one from 1776.co (no longer is business) and one from SWIG. I gave one to a friend and kept one for myself. That left me with one question… what do I do now? How do I clean a flask? After some research, there’s still no answer because the debate between soap vs. just hot water rages on. Soap leaves a residue, but hot water alone may not clean it. Just think of these beautiful pictures of whisky residue captured by this photographer. That’s what is going on inside the flask, out of view. It will react with stainless steel, it’s actually corrosive. That’s bad bad bad. So rinse it out with hot water, use soap if you want to, give it a few good shakes and flip it over to dry. Personally, I just rinsed it out with hot water about five or six times. I checked it after it dried overnight and I couldn’t smell anything. The first time I tried whisky, it was in a standard rocks glass. Straight sides, wide opening, plenty of space for an ice cube or three (though I didn’t put one). If you had asked me, back then, if I thought the glass made a difference I would’ve probably said no. Over the years, I’ve come to appreciate the shape of glassware and it’s impact. I’ve enjoyed whisky in the well-known Glencairns, I own several Reidel Vinum single malt glasses, and sometimes I like the fun and feel of a rocks glass. One glass that has gotten a lot of publicity, is used in judging competitions, but hasn’t yet appeared in my hands? 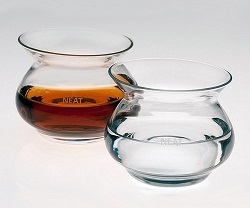 The claim to fame of the NEAT glass is that its shape removes the nose burn from the alcohol in whisky. By dissipating the nose burn, you’re able to better identify and enjoy the subtler flavors. I was sent a pair of NEAT glasses and in just my first time trying them out, the claim that it allows the alcohol to dissipate is legitimate. The next step was to do a head to head to head with the glasses I have. I put the NEAT glass up against a Glencairn, a Reidel Single Malt glass, and your standard festive “help you through the holidays” rocks glass. The whiskey in the glass is a Templeton Rye. A relatively simple dram, from a nosing and palate perspective, not a ton of depth, but you could really tell glassware made a difference. Rocks Glass: The opening is too large, alcohol could dissipate but so could most of the complex flavors and scents. Now that I know what it’s like head to head, I will not be drinking whisky out of a rocks glass again. This was eye opening to me and surprised me the most. 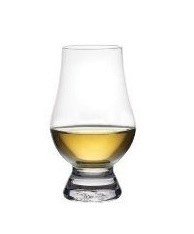 Reidel Single Malt: This glass has a similar opening, which had the same effect of dissipating some of the alcohol. Not nearly as much as the NEAT glass, but the opening is not as pronounced. 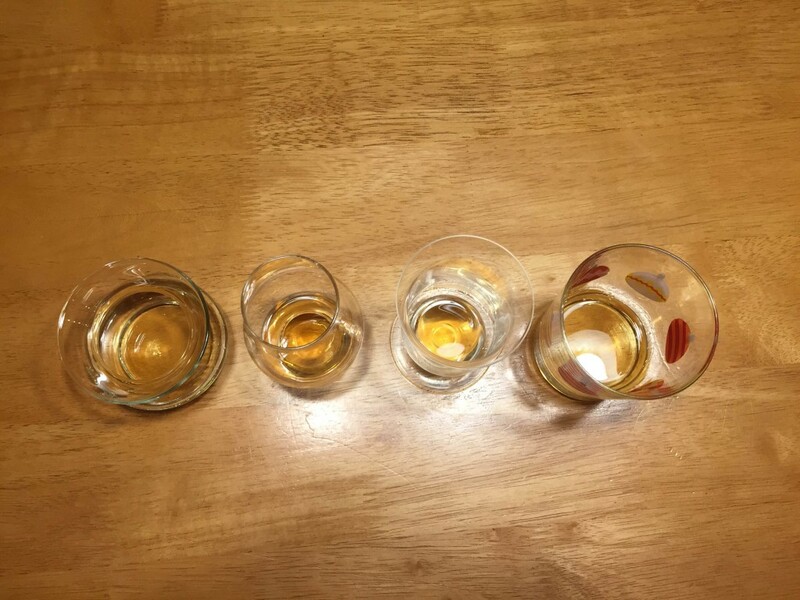 Glencairn: You get everything. Nothing escapes you, alcohol included. I’m used to it and so I’m able to enjoy the complex flavors underneath the alcohol, but when you nosed it side by side, you really can tell the difference. NEAT: Similar to the Reidel Single Malt, in that alcohol is dissipated, and the complex flavors shined. I think it’s because the glass is shorter, so you’re able to get your nose closer to the spirit… but there’s a marked difference. OK, Templeton is fine, not all that exciting, but I wanted to start somewhere. Did things change when I put something with a little more depth? I put in some Laphroaig 10 and that’s when the glass made a difference. The notes about the Glencairn and Rocks glass still hold true, the difference between the Reidel and NEAT was far more pronounced. Perhaps even an order of magnitude. One thing that takes a little getting used to is how it opens up at the top. Most glassware tapers and it actually focuses the liquid for easy delivery, by having it open out it’s a little when you pour water out of a vase, if that makse sense. What about this sweet spot? The opening of the glass is much wider than others and so is the potential “sweet spot” for nosing. It’s actually not directly in the middle of the opening, it’s off to the side about halfway between the mid-point and the edge. Is it worth it? Yes. It does what it says it does and it’s reasonably priced. A pair is available on Wine Enthusiast for $24.95. A pair of Glencairns will run you around $16-18 so it’s comparably priced with what is seen as the gold standard. A pair of Riedel Vinum Single Malt Whiskey Glasses, which offer similar “performance,” is near $50. I’ve often said that drinking whisky, whether it’s a single malt or not, is like listening to an orchestra. At first, you hear the sounds in harmony and as a song. As you experience more, you are able to pick out different instruments as you go searching for them. If you’ve never heard a violin, it’s very hard to pick it out of the cacophony. The NEAT glass, and the Reidel single malt glass, simply takes the drum corp out of the band. It’s easier to hear the flutes if you don’t have to fight through the heavy thump of the drums. The Glencairn is still going to be my favorite glass because you get everything – flute, violin, and the drum corp. You get that alcohol burn and you’re force do fight through it to get the subtler flavors. But sometimes you don’t want to do that, sometimes you want to explore a new dram without the confusion. The NEAT glass softens the drum corp so the other instruments can shine.